Client satisfaction is our top priority. Without it, we wouldn’t have the business we do today! Read more about what our clients are saying below. Two of your best men came today and nailed by flashing down nice & tight! Thank you for coming so quick! I know that this kind of tiny job is a nuisance for you guys. But this old retired guy sire is grateful!!!! I apologize for the delay in conveying my appreciation (Job was done Aug 17/17) however wanted to say thank you for giving me a good price on the roofing for my house as well as guaranteeing a good job. I am very pleased; your crews did a very good job, were very courteous and considerate. I have relayed this information to a number of people so I hope that they will also come to you; I know that they would be very pleased as well. Just a brief note to acknowledge the fine work of your entire Baron Roofing team. All were very professional and did a great job installing our new roof including preparation, clean-up and follow-up.Very pleased with the results….Thank you. Sandy & I would like to take this opportunity to thank you for the great roofing job that you have accomplished for us. Needless to say, our roof had issues, and the previous roofer (and shingle manufacturer) didn’t do a good job. During the process, we became more aware of requirements and roofing in general. Your salesman, Will, explained terms to us, and answered all of our questions and concerns. He did a great job of following up and worked hard at getting the business for you. We felt we were getting good value. After making our decision, you scheduled our roof installation quickly. We are very pleased, especially since it is raining again today! When the day arrived for installation, the project manager called to tell us of the impending arrival (after a warning a couple days earlier), and they arrived promptly with your lead hand. He responded to my questions and continuous watching with great interest. All crew members did their particular task without much direction (so it appeared). When required, they worked as a team, and all members did all types of the work. We could certainly see how a large job like this could be done so quickly when all were qualified and willing to do what was necessary. A few little extra favours were done for us as requiredc and we appreciate that. At the end of the day (even though it was late in the day), everyone did their jobs, participating in the property clean-up and truck loading. No one appeared to be in too much of a hurry, so quality of safety wasn’t sacrificed. Many thanks for all the photos – they will make a good record for us. The roof looks good, and the neighbors commented on how efficient your operation was. Just a note to thank the guys on the roof in the rain & SNOW for the great job they did. They are very professional group – courteous, not loud or yelling at each other. They always let us know what was going on. We had some additional work done not listed in the quote, but they charged us fairly. Excellent clean-up around the yard, and the roof looks GREAT. I received this email from BP in regards to my claim. Many thanks for your assistance and all your good people at Baron in preparing the information and photos necessary to satisfy the claim. Other good news: my roof weathered the high winds of this past week! It is great to deal with a firm that is very professional in its approach to the customer, and supports the client beyond the sale of a roofing system. Just wanted to say thanks for the great job you did on the beach house on Lakeshore Rd. It was a pleasure to watch you work together as a team. About 5 years ago, there were many roofs done around the street where I lived and I watched the crews at work. Many of them left me unimpressed (in fact, I noted the company and did not consider them for this job). Thanks for a job well done. Have the crew have a coffee and donut on me (you’ll need it now in this colder weather!). Good luck on your future jobs. It was a real pleasure. I wanted you and the company to know how happy we are with our new roof. The crew did a great job, left our property clean, and managed to get it done in 1 day! We love the weathered wood colour you helped us choose, and our house looks amazing! It would be my pleasure spreading your good name around town. Whenever we hear of any customers needing a roof, we refer them to your company! Thank you again for all your help in choosing the right shingles. We would like to thank Baron Roofing for the wonderful job your company did with our house. You completed our roof installation in one day! And you left our yard immaculate – no nails in the lawn. We found your company through referrals and our neighbours, and we feel absolutely satisfied with your services. Please do not hesitate to use our names as referrals for anyone looking to replace their roof. It was a pleasure talking with your sales rep. I was impressed with the detail you provided me about the roofing estimate, including the details about and benefits of the materials used, and the quality of workmanship involved. The crew came today, and they finished the job in one day. They behaved very professionally, and paid attention to detail in their work. They did everything with the materials and specifications you had explained during our meeting. John, the supervisor, answered all my questions and addressed any concerns I had. The crew also did a thorough clean-up after the job. All in all, I had a very pleasant experience with Baron Roofing, from start to finish. It goes without saying that I’ll recommend your company to anyone in my acquaintance. I am writing to thank you for your prompt service in both recognizing and resolving the problems with our eaves trough and downspout. Again, I wish to emphasize that your crew, both on the original install and during the corrective work, were WONDERFUL! They are very professional, quick, tidy, and most of all, polite. Your kindness in understanding the issues is very appreciated. We had our roof done by your company. Our recent dealings with you only further confirms our decision. In this day and age when companies come and go so quickly, and when the phrase “customer service” is often used yet seldom applied, you and your business stand head and shoulders above others. Thank you again for your help, and please know, for what it is worth, you gained a customer for life and whatever word-of-mouth support we can provide. Just a note to thank Baron Roofing for their excellent service and quality workmanship. Once again, we found your staff to be professional and knowledgeable. Your team answered any questions or concerns quickly, and left the site clean and tidy. Most of all, it was clear that attention to quality was important to the crew. Overall, it was a very good experience, and we are happy customers. Please share this letter with the crew of workers who re-shingled my home. I was impressed with the speed and efficiency with which they carried out the project. It was a great team effort. I am pleased with the result of their expertise, not only in re-shingling the roof but also in cleaning up after each day’s work. Well done, gentlemen! You may be interested in knowing that some of my neighbors have also commented on a great job they did. Thank you, Terry, for running such an efficient operation. On Thursday, Aug 26, we had a new roof put on by your company, and I wanted to drop a line to thank you for the exceptional job the crew performed on our roof. Estimate on Monday, new roof on Wednesday. That’s pretty hard to beat for service! I consider roofing one of the most physically taxing and dangerous jobs. Your crew worked hard and steady all day without one complaint. I will recommend your company without hesitation. On Thursday, Aug 12, we just wanted to let you know how impressed we were with Baron Roofing. Your crew was excellent. They worked hard, they were polite, they cleaned up everything, and they even had the roof and plywood completed in one day. They worked 12 hours straight! Thanks also to Rick for never making me feel like I was just another job, and for taking care of a million details that had me stressing out for almost 3 years now. 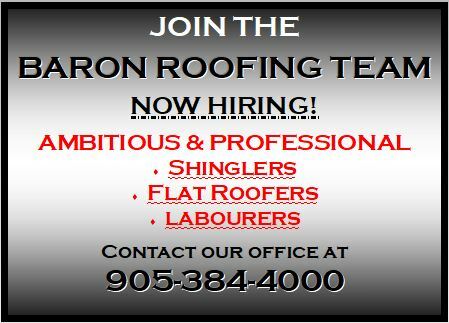 Every chance I get, I will promote Baron Roofing!! On Tuesday, May 2nd, we had a new roof put on our home by your company. The seven-man crew was headed by Leonard “Pudgy” Bird. They arrived on time (appropriately dressed) and began work immediately. Each of them seemed to have specific tasks, which were handled efficiently, and they all worked together well. They were all pleasant and well mannered. The work was completed in a timely fashion, and the clean-up was impressive. Except for the dumpster in the driveway, you would never know that the work crew had been here. This group of young men has an excellent work ethic, and they are to be commended. They are definitely an asset to your company. Please express our appreciation to them for a job well done. We just want to thank you for the great job you did on our roof. The men seemed to never stop, and we appreciated how energetic they all were. This is a credit to your company, and we would not hesitate to recommend your workmanship. I found your roofing company through and internet search, and I was initially somewhat apprehensive, being new to the Niagara area and having no company referrals on which to base a decision. Our neighbors were not familiar with your company (now they are, and are most impressed). Of three on-site quotations I obtained, I found Mike to be the most informative. Your rates were competitive and the contract was detailed. An extensive list of customer referrals allowed my wife and I to check out a property with a matching shingle color and brand. Three customers we contacted had nothing but praise for your services. The crew of 10 came exactly on time and finished in one day, as promised. In contrast, a competitor is installing a roof one block away. His crew started two days prior – and two days later, they are still not finished. Meanwhile, it has rained and the customer’s house is covered with a tarp – the yard is a mess. I was present all day and watched the installation. The crew prepared carefully, covering windows and doors with plywood shields and removing breakable accent lights. While I’ve never installed a roof, I did do some homework on methods. The manufacturer’s instructions for installing Elk shingles calls for 6 nails. I watched and counted – 6 it was. When they encountered some rotten wood, they replaced the plywood. I was impressed by the display of efficiency and teamwork. The clean-up was just as efficient. Your crew took care to sweep the yard with a magnetic bar. When they left, the yard was clean – I found no nails. I will not hesitate to recommend your company to anyone looking to replace their roof. You have lived up to your noble name. Thank you for a quality job. Two summers ago, Baron Roofing replaced the shingles on our roof. Last summer, we hired a contractor to reface a section of the front of our home with stucco. In doing so, an approximately one-foot piece of metal flashing with caulking was required at the roof over the front porch to match the existing flashing. I called you from my place of employment at that time to complete the flashing. I am writing this letter in sincere appreciation for the work that Baron did. By the time I got home from my work, your installer already had the flashing and caulking completed. It matched perfectly. I fully expected to receive an invoice from Baron for this job. To this date, I have not received such an invoice. I sense that Baron completed the work free of charge which is very generous of you. For that, both my wife and I are very grateful. Please be made aware that my wife and I have spoken very highly about Baron Roofing to all our family and friends. The quote at the bottom of your stationery, “Our References Speak For Themselves,” is very true. Please do not hesitate to call us should any of your customers wish for an opinion about the craftsmanship and ethics of Baron Roofing. We are so very pleased that we decided to go with Baron Roofing two summers ago! I am writing this letter to express my sincere thanks for the wonderful job you did in updating my house. The new roof together with the windows, soffit, fascia, and eves trough have really updated the look of the house. Please thank all of the people who worked on my house. All of your employees were true professionals and very easy to deal with. I had some concerns, being a senior and getting taken advantage of, but you really did an excellent job, and I am truly satisfied. Please feel free to use me as a reference for any future jobs. You did a first-class job on my house. I think that this is a testament to you and all of your employees. I am very happy with the job that you did, and would highly recommend you to anyone considering the home improvements mentioned above. I have just had a new roof put on by your crew. Dwayne and his team did a great job – very efficient and polite. They cleaned up without a trace of anything left behind. Now, I’m waiting to have a new trough done, and I know that will be a great job too. It has been over one month since the roof has been done, but we feel a note of thanks for such an extremely well-done job in such a short time is necessary. Baron informed us on the Tuesday that they would deliver the shingles early Wednesday morning, and that the crew of roofers would come and begin our roof in the late afternoon, completing it the following morning. Everything was done as promised!!!! Clean-up took place constantly, with a final clean-up done on both days upon leaving the site. They left behind no mess at the finish. The seven-man crew worked together, enabling us to realize why they could complete the job in such a short period of time. The men acted courteously, and with a good sense of humour, too. Our neighbors, Lorraine and Tony, had told us your company had done a great job for them, and we fully agree!!! Thank you, Baron, for a great job done.